Is It Too Early for 2016 Polls? There are more than 1,000 days before the 2016 Iowa caucuses, but several polls have already been released testing national support for prospective candidates for the Republican and Democratic nominations for president. Former Secretary of State Hillary Rodham Clinton has a huge lead on the Democratic side. Surveys show the possible Republican field as more competitive, with Senator Marco Rubio of Florida out front and Gov. Chris Christie of New Jersey clustered with several other candidates in the top tier. But isn’t it too early to even look at such polls? Aren’t they more valuable as entertainment than information? An examination of pre-midterm presidential polling since 1984 — surveys conducted from the day after the preceding presidential vote to the day before the midterm elections — shows that while early primary polls are not determinative, they are not meaningless, either. Presidential polls generally become more numerous after midterm elections, and our polling database is too spotty in the pre-midterm period to draw a solid picture before 1984. Since 1984, however, we have at least two pre-midterm polls for each party for each election, and those surveys have followed a consistent pattern: the early leader on the Republican side is very likely to become the nominee, while the early leader on the Democratic side is not. For both the Republican and Democratic parties, pre-midterm polls have generally guessed only about 50 percent of the field of candidates correctly — about half of the candidates included in early polling decided not to run, and roughly just as many candidates not included in any early polls entered the race. Significantly, however, the eventual nominee for each party has been included in at least one pre-midterm poll in every cycle since 1984. 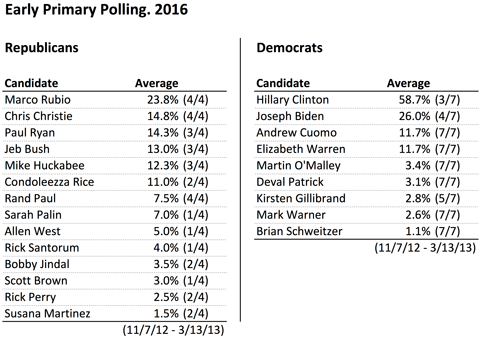 With half of the actual candidates missing from early polling, the surveys’ perfect record in including the nominee might seem surprising. But in addition to including the eventual nominee, early polls also correctly identified the top tier contenders, especially since 2004 when pre-midterm polling become more robust. The last miss of a major candidate was in 2000: Senator John McCain of Arizona was not included in any of the six polls conducted before the 1998 midterms, yet he proved to be the main challenger to the ultimate nominee, Gov. George W. Bush of Texas. In fact, most of those not included in the early polls who did later get into the race fizzled once voting began (for 2012 that list includes Jon Huntsman, Rick Perry, Herman Cain, Michele Bachmann and Buddy Roemer). This, perhaps, speaks to the need for successful candidates to begin laying the groundwork for a campaign early, gathering money, party support and campaign infrastructure in the “invisible primary” and thus tipping off pollsters of their potential interest in running for president. Identifying the field is one thing, but how have pre-midterm polls done in identifying the eventual nominee? Polls of the Republican contests have been prescient. Since 1988, the early Republican front-runner went on to win the nomination in three of the five open primary campaigns. In the other two election cycles, 2008 and 2000, the second-place candidate went on to win. In early polls for 2008, Mr. McCain was just two percentage points behind Rudy Giuliani, the former New York mayor whose campaign fizzled once voting began. And in pre-midterm surveys of the 2000 Republican primary, Mr. Bush was five percentage points behind the former Secretary of State Colin Powell, who did not run. On the Democratic side, however, the early Democratic front-runner failed to win the nomination in all five years in our sample, 1984, 1988, 1992, 2004 and 2008. (The 2000 cycle is not included because there were no Democratic primary polls available in the pre-midterm period, from the day after the 1996 presidential election to the day before the 1998 midterms). Early Democratic polls came closest to calling the winner in 1984, when former Vice President Walter Mondale of Minnesota — the eventual nominee — ran a strong second behind Senator Ted Kennedy of Massachusetts, who never entered the race. Besides 1984, the only other year in our sample in which the eventual Democratic nominee polled in double digits before the midterms was in 2008, an anomalous case. President Obama, with 17 percent, was second to Senator Clinton. But while our database has 26 Democratic primary polls between the 2004 re-election of President Bush and the 2006 midterms, Mr. Obama was included in just one. It was not until after the midterms that Mr. Obama, the Illinois senator, began to appear in most surveys. In 1988, 1992 and 2004 — all years with a Republican president or vice-president running for election or re-election — many Democratic front-runners in early polls never entered the race, and candidates in the single digits went on to win the nomination. In 1992, for instance, Gov. Bill Clinton of Arkansas won just 3 percent support in the one pre-midterm poll that included him. He was stuck behind eight other Democrats. But, perhaps scared off by President George Bush’s strong approval ratings in 1989 and most of 1990, all eight of the Democrats polling ahead of Mr. Clinton declined to run. What does all this say about the early 2016 surveys (almost all of them are from the Democratic-leaning pollster Public Policy Polling)? If Mr. Rubio can maintain the polling lead until the 2014 midterms, history would suggest that he will very likely run in 2016. In our sample, just one early front-runner on the Republican side, Mr. Powell, decided not to seek the nomination. But Mrs. Clinton may be able to break the Democrats’ early front-runners’ losing streak. Her lead in the polls we have so far exceeds that of any other candidate — of either party — in any election cycle in our sample. Many observers have pointed out that Mrs. Clinton also had a large lead in early polls of 2008 and yet lost that race. But her 2016 lead over Mr. Biden (33 percentage points) exceeds even her 2008 lead over Mr. Obama (22 percentage points). And she may benefit from the sense of being “the next in line,” having been the runner-up in her party’s last open contest — a dynamic seen in several recent Republican primaries. With such a small sample — only five election cycles for each party — and just a few pre-midterm polls available in each cycle before 2000, it could be risky to read too much into the pattern of Republican accuracy and Democratic inaccuracy in pre-midterm primary polls. There will be many more polls before the 2014 midterms, the Republican and Democratic front-runners may change, and recent history suggests the eventual field for each party is quite likely to look very different than the one shown above. But that doesn’t mean that the polls we see over the next 18 months aren’t worth noting.